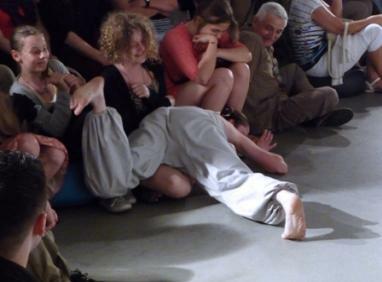 Butoh dancer TO-EN and sound artist Timo Viialainen in a clash between place, sound and audience. Order in disperse. Harmless disturbances born in the brisk exchange between body and space. Collision – agitation – resistance. Interruption – tumult – surprise. Premièred at: BWA Zielona Gora, Poland, 2013. Performed at: CSW Łaźnia, Gdansk, Poland, 2013. The project was supported by the City of Gdansk within the Cultural Scholarship of the City of Gdansk. 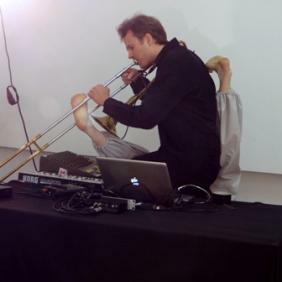 A Helsinki-based sound, performance and video artist who explores the areas of conceptual art, our way of experiencing the immediate and the conflict of our senses and the intellect. Since he started to do solo performances in 2011, Viialainen has performed extensively in Europe and Northern America. Member of "Lá-bas", a forum for experimental arts operating in Finland. During its 11 year existence, "Lá-bas" has organized over 80 events in Finland and abroad and has contributed significantly to the Finnish field of performance art, sound art and forms of live art experiments which lack any clear definition.